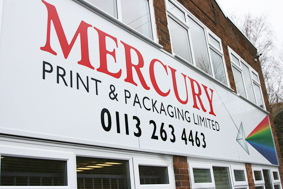 Offering "The Total Print Package" Mercury Print & Packaging Ltd prides itself in offering a personal service while delivering quality work to exacting standards at competitive prices. Mercury Print & Packaging Limited is a privately owned family run company with over 20 years of successful trading behind it, operating from its own 25,000sq foot factory close to the centre of Leeds, Mercury employs over 20 staff all who are print industry trained professionals offering a wealth of experience and printing knowledge. Mercury has built up a large and loyal customer base over the years ranging from small businesses to large PLCs and includes public sector clients and NHS trusts. Mercury offers a complete in house print service with print processes that include digital colour, single and multicolour offset litho, specialist foil blocking, embossing and traditional letterpress printing and die cutting, these are complimented by an in-house design studio and comprehensive finishing department. Mercury also has an envelope division which stocks and supplies plain and printed envelopes nationally. Mercury's vast range of equipment allows it to respond to customers individual requirements for both on demand short run work to large production runs, covering any print requirement from personal and business stationery, business forms through to leaflets, brochures and packaging, along with a recently added business promotional products side producing printed mugs, key rings and fridge magnets. Mercury also offers a complete private and secure print facility, for ticketing and confidential document printing. Mercury has its own stock and job tracking system enabling them to quickly check their vast raw material stocks or the progress of individual customers orders or stocks. To compliment the production facility Mercury can ensure speedy, direct deliveries using its own fleet of delivery vans and if necessary can do desk top deliveries throughout any customer’s organisation.